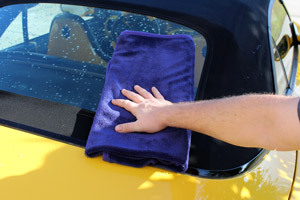 An innovative twist on microfiber car drying towels! The GYEON Silk Dryer is an incredibly innovative drying towel that safely absorbs tons of water leaving your vehicle perfectly dry and water spot free. This towel features an 80/20 blend of polyester and polyamide as you’ve come to expect in many microfiber towels, in this case however it’s been woven into a unique, water devouring texture. The GYEON Silk Dryer isn’t your typical drying towel, it’s better! Drying your vehicle can be a hair-raising task. One wrong move and your quick maintenance wash becomes an all-day polishing event. It’s just so easy to scratch or mar the surface when you use the wrong drying towel! The GYEON Silk Dryer helps you minimize the risk of marring paint—even the soft stuff-during the drying process. The GYEON Silk Dryer is thirsty! Easily dry your freshly wash finished with this paint-safe towel. The GYEON Silk Dryer is thirsty! It’s composed of thousands of tightly twisted microfiber strand that immediately start drinking up water as soon as they hit the surface of your vehicle. If you thought that waffle weave towels were the only way to dry a vehicle, think again! The GYEON Silk Dryer dries panels in one pass, leaving a streak free, water spot free finish every time! Excellent drying capability! Large, absorbent, soft - (non-scratch surface for ceramic and polished surfaces); just plain right for drying car after foam wash and drying without blow drying! And the customer service of Autogeek / Autopia is the best very attentive and friendly, thanks. I've used a chamois my whole life and I'll never go back. This is a super thirsty cloth that can cover my minivan and pickup truck and still keep absorbing. Leaves the car dry and never seems to stop absorbing.